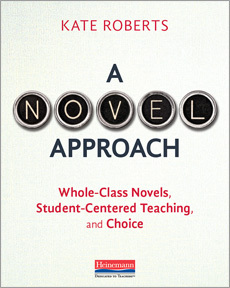 7/30/2019 08:30 AM - 03:00 PM _Check In Opens at 7:45 A.M.
As an English teacher, Kate Roberts has seen the power of whole-class novels to build community in her classroom. But she’s also seen too many kids struggle too much to read them--and consequently, check out of reading altogether. Kate’s had better success getting kids to actually read – and enjoy it—when they choose their own books within a workshop model. “And yet,” she says, “I missed my whole-class novels.” In this workshop, based on Kate’s book, A Novel Approach, she will take us on a deep dive into the troubles and triumphs of both whole-class novels and independent reading. She will help us to find a student-centered, balanced approach to teaching reading. Kate will offer a practical framework for creating units that join both teaching methods together. Any registration cancellation must be received before Friday, July 19th, 2019 in order for a full refund to be issued. Registration cancellations received after Friday, July 19th 2019, a refund will be issued, but minus $50 for each participant in order to cover the cost of catering that was ordered and materials that were made for each participant(s). Persons who are registered, but not in attendance on the day of the session ("no call, no show") will be charged the full registration fee. CESA 6 reserves the right to cancel any session due to insufficient enrollment. Participants will be notified by email if a cancellation occurs. KATE ROBERTS is a literacy consultant, author, and speaker. She taught reading and writing in Brooklyn, NY and worked as a literacy coach before joining the Teachers College Reading and Writing Project (TCRWP) in 2005. Kate worked as a Lead Staff Developer for 11 years at TCRWP. Kate is the author of A Novel Approach and co-author of Falling in Love with Close Reading (with Christopher Lehman), DIY Literacy (with Maggie Beattie Roberts), and two Units of Study books on Literary Essay. Her work with students across the country has led to her belief that all kids can be insightful, academic thinkers when the work is demystified, broken down and made engaging. To this end, Kate has worked nationally and internationally to help teachers, schools, and districts develop and implement string teaching practices and curriculum.